Classic and still great :) ...that dub tho. I can't recommend this series highly enough. I first watched it I think fifteen years ago or some number that makes me feel way old. It's still great. The animation doesn't feel dated like a lot of older series; it's very fluid and consistent. The background music's memorable without being obtrusive. The story's good. There's not a single character that I don't love. And it's got some of the best Japanese VAs in the business. That said, I'm convinced this dub was actually five college students stoned off their asses doing a cold read of some mediocre fansubs. It's the only way I can explain a dub so bad that I actually PREFER *shudder* "Cardcaptors". So, yeah, watch the subbed version. Okay, CCS is by far one of the greatest anime of all time. The characters were absolutely lovable and the while it has the element of a Saturday morning cartoon, it maintains a certain level of magic. However, do not watch this dubbed. It will ruin it for you. Keep it simple, keep it subbed. My childhood all over again! Man, anime always ruined my sense of love and set false expectations on reality. Why don't I have magical powers! This was one of those shows because it was relatable. And I loved everyone one of the characters, Yukito & Yue, Toya, Tomoyo, Sakura, Meiling, Xiaolang... My life is complete now that this is on Crunchyroll and I got to watch it. Seriously, I love this series. It's positive, uplifting, and at times very emotional. The characters are lovable as can be—it's almost too much cute. Every time Kero-chan flips out for sweets, Tomoya gets starry eyed, or Sakura shakes her fist and stomps at Toya's kaiju remarks, I literally lol. There is so much to love about this CLAMP classic. 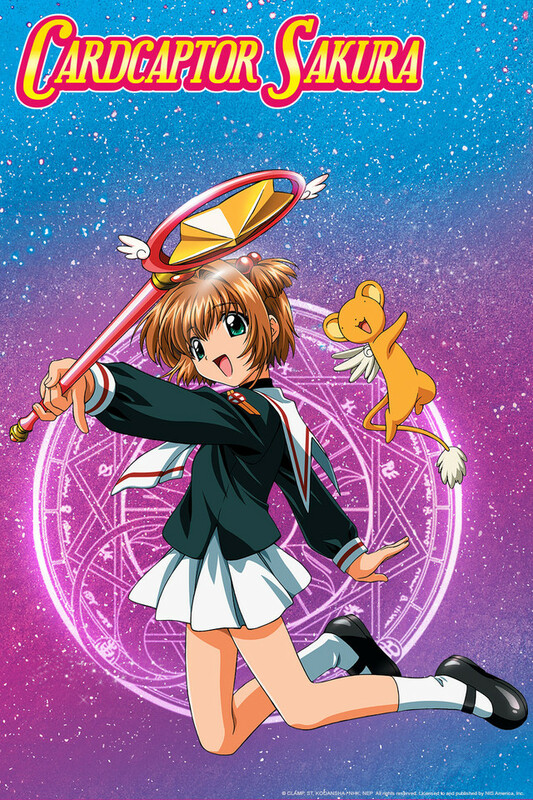 Cardcaptor Sakura is a classic anime series, based on the popular manga by CLAMP. Like all CLAMP stories, Cardcaptor Sakura is a unique experience that will keep you coming back for more. Unlike most magical girls, Sakura doesn't have the tired old transformation sequence found in just about every other series of it's genre. Her costumes are hand made by her best friend, which allows for a variety of beautifully designed costumes unique to the episodes their featured in. The magic she uses is also very unique, with each of her 62 magical cards coming with their own design, and even their own character traits as well. This allows the audience to feel good for the cards as well as Sakura when they are captured by her, as many of her cards are caught through kindness rather than force. Cardcaptor Sakura also has the unique innocence that is rarely found in many anime. Quite common in anime, despite the intended audiance, there is usualy a heavily implied sexual theme when it comes to female character. However, with such young protagonists, Cardcaptor Sakura is able to tell it's story without once relying on this trope to keep your attention. One of my favorite aspects of this series is how each and every character is deep and complex, even characters who are only around for an episode or two. For example, in one episode we meet a little girl named Yuuki. She is only in one episode, but from that one episode we learn so much about her and get so attatched to her, that you really feel her happiness when her wish is granted at the end of the episode. At the same time, the episode knows just how much time to spend with Yuuki, giving her just enough screen time to learn about her and who she is, without trying to force her into your face. This kind of care and attention to even it's smallest aspects is one of the things that makes Cardcaptor Sakura so great. My personal favorite thing about this series is the dynamic between Sakura and her best friend Tomoyo. The two are distant relatives who have been friends since they first met in 3rd grade. Tomoyo almost instantly fell in love with Sakura, but her love for the energetic ball of cute drives her to do everything she can to make Sakura happy. Instead of imposing her love on someone she knows can never love her back, she settles for watching over Sakura and doing everything she can to cheer her on. Weather it's by providing hand stitched clothes that bring out the peak of her cuteness, cheering her on as she pines for Yukito, or helping Syaoran to realize his feelings for Sakura after realizing he can make her the happiest of all, Tomoyo Daidouji is indeed the best friend a girl could ask for. The only thing I have ever had a problem with when it comes to this series is the dubs. Out of all the English addaptions of this series, the only version worth checking out is the dub of the second movie. The original dub, known as Cardcaptors, is a staple for everything anime fans tend to hate about dubs. While some less picky anime fans could forgive the changes to names, the other things the Nelvana dub changed were simply unbearable. One maijor difference is how the characters are presented, with personalities being unrecognizable to their Japanese counterparts, and quite often much more mean spirited than the sweet series of origins. The 2012 re-dub featured here on CrunchyRoll makes an attempt to retain the Japanese names, story, characterizations, ect; but at a heafty price. The voice acting in the series is so robotic and un-natural to the point where no matter how hard you try, you can't forget that these are people sitting in a booth reading lines. The re-dub doesn't even attempt to do the whole series, as certain scenes were cut out from the dub, and re-inserted for the CrunchyRoll release with subtittles so you don't miss out on what's supposed to be going on. I've never heard such awkward acting before On top of the fact that Tomoyo's voice changes every season, and no one seems to know how to say Syaoran's name(seriously, who do they think names their boy Sharon?) the redub is just awkward and difficult to listen to. With all this series has been through, and it's 15th anniversary right around the corner, it's a shame this can't get picked up by someone like Funimation, who could give this timeless series the love and attention it deserves. But for now, I highly recommend sticking to the subtitled version. I hope you enjoy this cute and lovable series as much as I did. Love. I mean, what else can I say? If you're a fan of the Mahou Shoujo genre, then for the love of all that is magical, watch this. Be sure to watch the subs version, not the dub. Also, should you finish the 70 episodes of the series, be sure to watch the second movie "The Sealed Card". You will not be truly satisfied with the conclusion of the anime until you do. No spoilers, just watch. Classic, fun and so glad it's now on-demand!